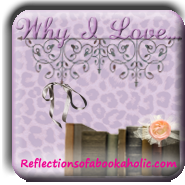 I am returning with my new feature... Why I love which takes place on Wednesdays. Today's proclamation of love concerns our whether we love book Series OR Stand-alone novels. Oh in this world of series, I have to separate myself from the book pack and admit I love love love stand-alone novels. I wish I had bookish reasons for my preference but honestly, my worst personality traits (or the ones I'm willing to share) contribute to this bookish obsession. First, I am horribly impatient. You mean I have to wait a year for the next book in a series? Ummm...nope...don't like it. Second, I don't like to be bossed around. You mean you are going to make me buy an incomplete book with an open ending so you can force me to buy your next incomplete book with no answers? Uhh... I want to pass. Lastly, I have a horrible horrible memory. I'm supposed to remember a book 12 months later? I pretty much have to reread the last book so I can remember all the pertinent details. Oh the pressure!! Plus, with all the awesome books around, I don't want to take the time to reread books. Oh it works for some people but not me. When I know what is coming, it just isn't as fun for me. Okay all joking aside, I can read a series if all the books are already written or if I don't have to remember the details in previous books (e.g. The Stephanie Plum series). But what I really love is a well-written stand-alone novel that makes me smile with glee at the end while making me want to cry in despair because it is over. I think it takes a considerable talent to draw a reader in, tell a story, and wrap it up in a reasonable amount of time without any gimmicky cliffhangers. Although it can be bittersweet at times, I prefer to get to know more/different characters each time I read. Ahhh..but I know that it's not that simple and I know some series (Harry Potter) do a great job of giving me all the things I like in a stand-alone in a series format. But I need to pick right? Which types of books do you love? Feel free to create your own post and link up. Don't want to create an entire post? Tell me your favorites in the comments. Thanks for stopping by for another week of Why I Love Wednesdays!! When naming your link, please choose the name of your post. Mine would say "Why I Love...Stand-alone Novels." I agree. It seems to really come down to great characters. I think the stand-alone story within the book is very much necessary. Cliffhangers... Uh! If an author has a cliffhanger, I am less likely to read other books written by that author because I don't want to take the chance. Completed series have no risk in my opinion. You have nothing to lose by reading them. So I can do that. That's all I feel. There are just so many great books and characters to get to. I love that feeling :) I don't have anger issues after books like that. Ha! I'm quite behind but if I haven't been around to visit, I certainly will. I get series fatigue too. When stand-alones end it is so much more dramatic because it really is the end. Oh I love it. Uh oh. That book is on my bookshelf. *sigh* In my opinion, cliffhangers are never okay. Yes paranormal works well in a series. If you come across paranormal in a stand-alone let me know. Lol. Agreed. I think that is why I'm veering away from series anyway. Loose ends and questions. Oh and the dreaded cliffhanger. I think it depends on how it is done. I like those too! I like that you get to revisit the characters while have a complete story with characters that can stand on their own. But I also like seeing the build up of a relationship of a secondary character and I know that his/her book is coming later. The characters are the big thing with series. I agree. A great character is hard to let go. I think 3 is a good number as well. But if I truly get hooked that won't take long at all. I didn't read the Twilight series until the entire series was out. I'm also one of those people who like people to tell me what happens in movies. There is no way I'm going to reread an entire series just so I know what is going on with the newest book. You are such a trooper. There are so many great books on my TBR list, I don't have the time. I'm kind of lazy. I just try to push it through. I've really just tried to stick with completed series. I think you described it perfectly. I prefer series that can tell an entire story encased in something greater. Cliffhangers just make me mad and I don't stay sitting on the edge of my seat for a year. Maybe for a couple of days but then I get over it and move on. It is so hard to say goodbye!! I have yet to read "Forgotten" but I'll have to give it a try. Stand-alones can be so bittersweet some times. I totally understand. Sometimes I don't choose either. But usually it is because I'm just being difficult. I hate the feeling of leaving characters too but there are sooo many great ones. I'm just so torn. I agree with all you! Short series that can stand alone. Is the Vampire Academy the same as the Vampire Diaries. I get so confused by it all. I know. There are series everywhere! I just want a good stand-alone. I don't have the patience for series. Interesting post and comments! I love both! I really enjoy a fabulous stand alone book and have a great time reading it- then feel a bit sad that it is over. I also love series. I hated waiting for each new Harry Potter book- but it was sort of magical at the same time. I can still remember the anticipation. Of course, when I can- I prefer to start a series that is already completed so that I do not have to wait. If a series is done well, then you aren't left totally hanging at the end of each book- but you know there is more to come. Yes, better a stand-alone than a series that gets dragged out unnecessarily! I have to agree, I enjoy stand alone books as well. I'm kinda finicky when reading, so I like to have new characters, with new settings, new worlds, etc. Oh, I love a good stand alone! Great post. I agree that I like the happy/sad feeling one gets when finishing a stand alone novel. Sometimes I feel like I'm getting series fatigue ! I don't know how people can read books that have more than 5 in a series. I need a few more stand alones in my life. I just want the author to tie it up. No lingering moments. No what ifs. Just finish it. I hate the fact that all of the paranormal YA books being released nowadays are all a part of a series. I would love to read a great paranormal stand alone if I can find one. Though I picked series, I really understand and can agree with your reasoning for picking stand alones. I generally wait until all the books are published before I read a series...at least lately I do. But sometimes the wait and anticipation can be fun. hmmm, this is a toughie!!! my fave series I think are the historical romance series, b/c each book is 100% complete in itself, but you get to revisit characters in the other books. you don't have that cliffhanger feeling at the end, but it's great to see familiar characters in the next books. Mixed feelings on this. I love stand alone novels but I also like series. This is so true about characters that I just admire and want to know more about their live or situation. i'm on an even borderline with this one. Thanks so much for helping me with button. its for my new challenge. I will email you now. I love stand series bu I never start one until there are at least three books out. I didn't even start Twilight until Breaking Dawn was out. Then the love starts. LOL!! I hate to wait too!! I have mixed feelings about this, there being both pros and cons of both stand-alones and series. I definitely hear you though on the memory thing. For most series, if I'm reading them as they come out, I have to reread at least the last one or even the whole series before I can read the new one. It takes way too much time if it's not something I was wanting to reread anyway. I agree with you completely! I can never remember what happened in the last book so when the newest book in a series finally comes out, I either have to reread it or just push through and try to remember all the little details of the last book. I also hate the wait! By the time the next book is out I end up forgetting what happened in the previous books. I have to admit that I'm 50/50, while stand alones are awesome I think sequels are great too because I feel sad leaving the characters and I love the feeling of knowing that the story isn't over yet, you know? I have to admit - I love both!!!!! I do love "stand-alones" but I also love series! I really hate to say good-bye to great characters that I love. And I just want the story to go on and on. There are some books that I was so happy that there was a second and a third. And there are some stand-alone books that I wish there was a second! "Forgotten" by Cat Patrick was one of them. I loved it so much, I wanted more. I even went as far as checking the Author's web-site and sadly, no there is not a second. But she is writing another book! Yes! You said exactly what I've been thinking all along. I always wondered why I didn't read more series but I think it's because I just like the wrap-up of a single story. Even if it's an ambiguous ending (which I prefer anyway) it's still better than having to waaiiitt for the story to continue with the very likely possibility that I'll have lost interest and moved on to something else. So, yeah. Stand alone books are how I roll. I love series. Yes the time between each book can agonizing. But I love getting to know the characters and watching them develop throughout a series. I just don't feel satisfied when I read stand alone novels. I have read some great stand alones but all I could think of after I was done was that's it? What happens next. I'm a series girl. I guess we can blame Nancy Drew for this. Amen! Book world needs more stand alones! I like stand-alones novels too. I agree on having to wait a year to read the second book, or the third...etc. Come on! But I do love series novels too. If I really like the characters then I want to continue reading about their adventures. But stand-alones are nice. There's not very many of them! For instance, I enjoyed Her Sister's Shadow. It was lovely, simple and it had an ending. I wasn't left with gee, what's going to happen next. Some of these books that leave you hanging can be downright dreadful to a reader! And what about the "cliffhangers of doom" I've read so much about. That's why I'm afraid to read The Unbecoming of Mara Dyer. I've read on blogs about it's "cliffhanger of doom." Oh...no! I loved Nancy Drew as well. That's the kind of series I can get into because each book has its own plot and a conclusion. When I read a book, I want an entire story. I usually only get the whole story from a stand alone, so that is my preference. You are right about Harry Potter. Some authors are capable of giving you an entire story encased in something greater that allows for a wonderful series. Some authors have to go for the ol' cliffhanger (where's the rest of this story) ending to get you hooked.